The HQ Toxic kite is a great quad handle power kite. When you are ready to challenge gravity, the Toxic provides the speed and power you need to take a flying leap. With a higher aspect profile for faster performance and more lift, the Toxic remains stable and easy to control in challenging conditions. Buggying: The HQ Toxic 5 gives you an experience like no other on a buggy. No matter what your style recreational cruising, freestyle tricks, or racing the Toxic will give you endless hours in a buggy. Landboarding: The Toxic is great for landboard or mountain boards due to its consistent pull and stable flying. This means you will get no surprises when you are cruising, flying or sliding your landboard around. Also the HQ Toxic can give you so great lofty hang time. 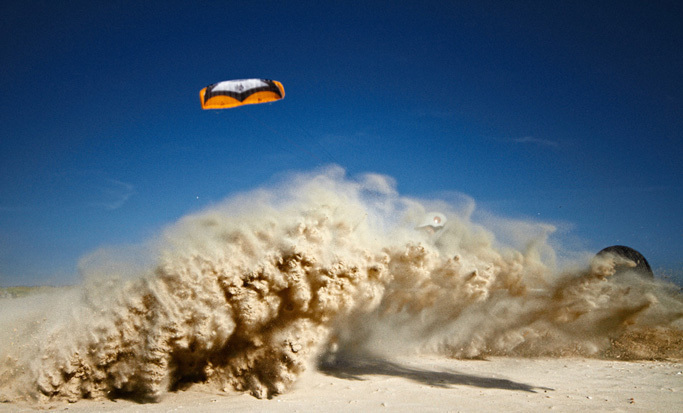 Jumping and Skidding: This is a great way to get started in the sport and getting used to flying quad handle kites. When you steer the HQ Toxic 5 in medium winds, you will start to feel the pull and power of the kite. This will allow you to power up for a jump, or skid. One tip is don’t run forward when the Toxic power kite starts pulling, just lean back and slide on your feet.